My gals in Little Mix continues to swing from strength to strength as they drop yet another clue toward what third album Get Weird will sound like. "Black Magic" was sparkly summer pop. "Hair" was a shady bop. 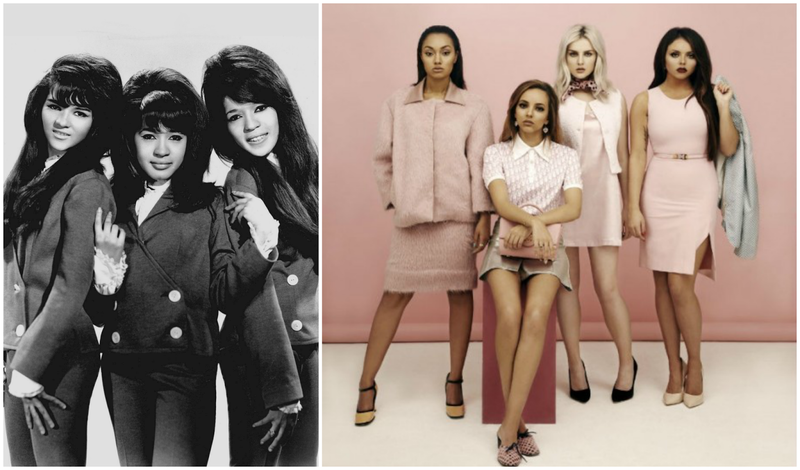 And their new single, "Love Me Like You", is a downright 60's girl group throwback. I'm a sucker for this style and honestly, you should be, too. "Love Me" is a confident midtempo with a sparse drum-beat, string bass, and somewhat tongue-in-cheek lyrical content wrapped in good-girl-playing-coy packaging. The production is the real MVP here with purposefully echo-y vocals with more straight-ahead harmonies than what LM usually offers to mimic that Phil Spector-produced sound. Basically, it's hard to listen to this and not picture big hair, bold and winged eyeliner, matching dresses, and the entire group singing around one microphone. It was co-written & produced by Steve Mac who gave us the brilliance that was The Saturdays "Notorious". As much as I adored Salute, the upcoming Get Weird is shaping up to be the true testament to Little Mix's versatility in the pop game and I couldn't be more happy about that. (PS -- also recently premiered "Grown", arguably also 60's girl group-esque, was co-written by Jess Glynne. I mean. I meannnnnnn.) The album is due out November 6th, so what I'm saying is this: wake me up when October ends. 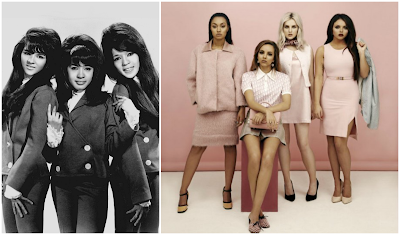 In addition to la Mix, there's been plenty of fab 60's Girl Group Homage cuts in recent memory. Who's down for a mini-playlist? BETTE MIDLER - "Be My Baby"
It's a little on the nose but Lady B's cover of the Ronette's classic is almost as good as the original (I mean, she is Bette Midler, after all). It was featured on her latest disc, the cover album dubbed It's The Girls. If "Love Me Like You" had a sonic cousin, it would be the under-appreciated "Black Heart" by the equally under-appreciated Stooshe -- who are still very much a thing and are working on a follow up to their debut album London With The Lights On. In fact, someone should mash these two songs up. Arguably one of my favorite KPOP girl groups of the moment, Mamamoo's appeal lies in their vintage sound, bolstered by their vocal talents. "AHH OOP!" is textbook 60's girl group, complete with the outfits and mod makeup. Even in hindsight, its surprising that "The Promise" was considered a risky move for the Princess of UK Girl Groups. Much of Paloma's excellent most recent album, A Perfect Contradiction, could fall under this heading but this song really cooks. WONDER GIRLS - "Be My Baby"
What, you expected me to suggest "Nobody"? That one is good, too, certainly, but "Be My Baby" really nailed it for me -- it was the classic Wonder Girls sound mixed with modern flair and didn't have to rely on old tropes to make an impact. THE PIPETTES - "Pull Shapes"
Gleeful 60's homage with lyrics that could work today. As they say, "don't care what the song's about". MUTYA BUENA - "B Boy Baby (feat. AMY WINEHOUSE)"
After she exited the Sugababes, Mutya went solo for a little bit and released this glorious nugget of pop (which sampled The Ronettes' classic) and featured Amy right around the time she was firing and hitting with her Back to Black album. If we only knew then what we know now. A classic Spice ballad to be sure but all this ballad lacked was that characteristic Spector-esque drumbeat. Love a song that I didn't mention? Leave it in the comments!